· Snapshots enable you to go back in time when a software update or configuration change blows up an otherwise healthy server. · Virtual hard disks consolidate the thousands of files that comprise a Windows server into a single file for backups, which significantly improves the reliability of those backups. · Volume Shadow Copy Service (VSS) support, which is natively available in Hyper-V, means that applications return from a restore with zero loss of data and immediately ready for operation. · Migration capabilities improve planned downtime activities by providing a mechanism for relocating the processing of virtual machines to new hosts with little to no disruption in service. · Failover clustering means that the loss of a virtual host automatically moves virtual machines to new locations where they can continue doing their job. What’s become much more critical is that the servers/application/services to keep on working. To Provide High Availability, we need to design properly our environment. With the right combinations of technology, you can inexpensively increase the availability of your environment. Also, Hyper-V requires an x64-based processor, hardware-assisted virtualization, and hardware-enforced Data Execution Prevention (DEP). Specifically, you must enable the Intel XD bit (execute disable bit) or AMD NX bit (no execute bit). I would recommend Dell Equalogic, Compellent, IBM NetApp, EMC, but you should evaluate others vendors. If you need to use software-based iSCSI, look carefully at the features available. Microsoft clustering requires iSCSI to support SCSI Primary Commands-3, specifically the support of Persistent Reservations. Most for-cost iSCSI software currently supports this capability, but there is very little support for it in most open source software packages. How about the network configuration? 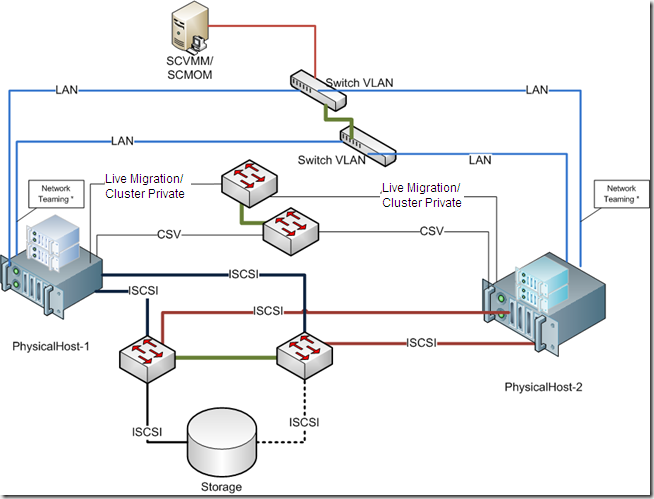 Here is my proposal and this is what I am using in terms of NICs/Ports:1 management2 private: 1 for cluster private/CSV primary, 1 for live migration primary2 for network (in teaming)2 for iSCSI2 Dedicated (NIC/Ports) for the Network traffic configured as teaming.The failover cluster should be disabled from managing this network. NIC teaming is the process of grouping together several physical NICs into one single logical NIC, which can be used for network fault tolerance and transmit load balance. The process of grouping NICs is called teaming. Teaming has two purposes:• Fault Tolerance: By teaming more than one physical NIC to a logical NIC, high availability is maximized. Even if one NIC fails, the network connection does not cease and continues to operate on other NICs.• Load Balancing: Balancing the network traffic load on a server can enhance the functionality of the server and the network. Load balancing within network interconnect controller (NIC) teams enables distributing traffic amongst the members of a NIC team so that traffic is routed among all available paths.2 Dedicated (NIC/Ports) for the CSV. (Minimum 1Gb). I personally recommend 10Gb. One a 2 nodes you can use cross-over, but if you plan to use more, than you need a switch. If you choose 10GB it means that your switch needs to be 10GB. Live migration should have a value of 11002 Dedicated (NIC/Ports) for the iSCSI traffic. ( Minimum 1Gb). I personally recommend 10Gb ( the difference in price will be about 10% more).Btw, remember: If you choose 10GB it means that your switch needs to be 10GB, also the Storage. VMM : Lan Migration using BITS fail with error: HostAgentFail (2912) … and HRESULT: 0x800704DD Desktop Virtualization Hour. 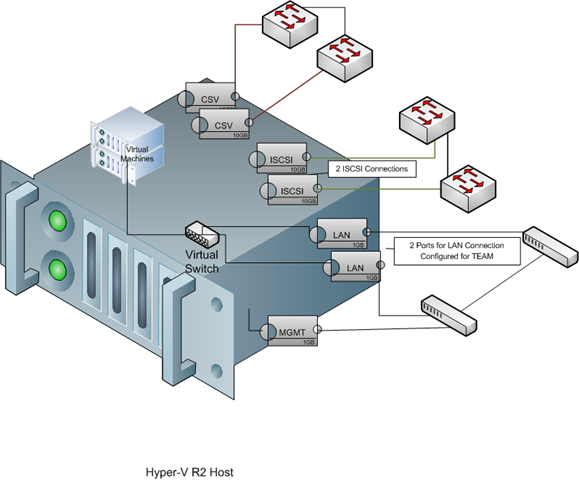 What are my virtualization options?